A woman who protested a ban on women attending sports matches by attending volleyball match in a stadium back in June has been sentenced to one year in jail after being found guilty of "spreading propaganda against the ruling system." 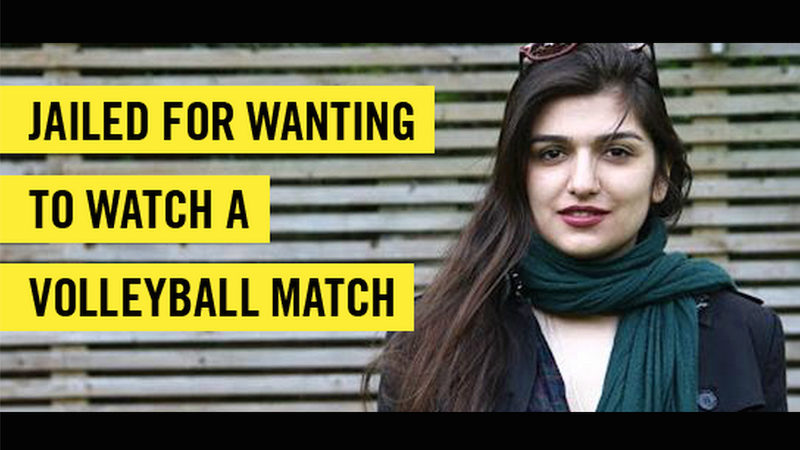 In June, Iranian-British Ghoncheh Ghavami (in Iran volunteering to help street kids) other women attempting to enter a stadium for a volleyball match between Iran and Italy's mens teams, protesting the ban on women attending male-only matches. The protesters were arrested and released after a few hours after allegedly being beaten, but Ghavami was arrested again a few days later. According to her brother, she was not able to contact her lawyer until her court hearing. She has been held in Evin Prison for 126 days, and has spent time in solitary confinement according to Amnesty International. Last month she went on a hunger strike. "I was told at the court today that my client's case has been referred back to the prosecutor because Ghavami is facing new charges. So, the verdict was not given to me," he said. Tabatabaei didn't elaborate what the new charges are or why fresh charges have been raised against his client now. The Free Ghoncheh Ghavami Facebook page points out that the "legal deadline to issue the verdict according to the section 212 of criminal law is 7 days at most, today marks the 28th day since Ghoncheh's court hearing and we have not heard any word." They also note "Ghoncheh has been in temporary detention for the past 126 days and her temporary detention expired 6 days ago and it is not clear to her family and lawyer as to what the current legal basis of her detention is." There are clearly several different instances of miscarriage of justice going on right now, and it is uncertain when the court will actually announce their verdict. Image via Free Ghoncheh Ghavami Facebook.